Here is the kind of zombie picture where the heroine falls on the ground for no reason when faced with an immediate threat and we are supposed to believe somehow that this is thrilling rather than silly or downright idiotic. For much of its ninety-minute running time, which actually feels at least an hour longer, the plot fails to take off. Boredom grips the mind and when it finally does get somewhat interesting, the twist is dropped so quickly in exchange for standard zombie film clichés. The material is in desperate need of rewrite. 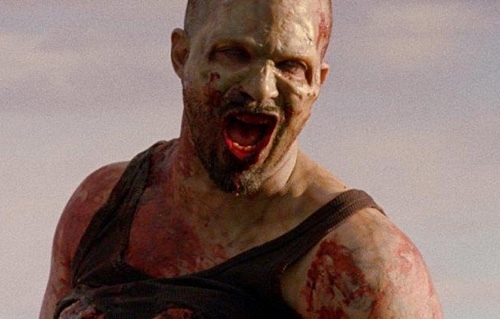 Directed by Colin Minihan, “It Stains the Sands Red” is set in a universe where the undead has taken over Las Vegas. Molly (Brittany Allen), an exotic dancer with drug addiction, is with her boyfriend (Merwin Mondesir) while on their way out of the city when their car gets stuck on the side of the road. Since they are in the middle of the desert, no help can be found nearby for miles. However, there is a zombie (Juan Riedinger) on the hunt for its next meal and it is closer to the couple than they realize. Much of the picture involves Molly walking around the desert while being followed by the flesh-eater. Painfully obvious is the fact that the situation is metaphor for the heroine literally being followed by the demons of her past. Writers Colin Minihan and Stuart Ortiz fail to assume that the audience is intelligent enough to see past the various symbolisms. Instead, the material adopts a repetitive cycle of a small chase between the woman and the zombie, Molly getting away somehow, day turning into night, a flashback into Molly’s life, rinse and repeat. No tension is accumulated because the situation is watered down by various attempts at dark comedy—only the humor is equally predictable as the metaphor. There is a twist involving a change in relationship between predator and prey that I thought paved the way for an interesting avenue. I wondered that perhaps the film is not supposed to function mainly as a horror film but an experimental think piece. But this proved to be giving the filmmakers too much credit too soon because just when it starts to get interesting, it moves onto a path so uninspired, so oft tread upon, that one wishes for the experience to be over immediately. Right then we know exactly where the movie is heading. Creating a badass heroine is especially difficult to accomplish. For one, a performer with range must be hired for the job. Second, the writing must be so on point yet so subtle that we believe the evolution without question whatsoever. Third, the story usually commands a standard arc but with enough fascinating pieces added throughout that we do not mind the typical dramatic parabola so much. But the film does not possess any of these qualities. Notice how the movie ends. There is no closure. Clearly, the writers do not understand what the movie is about. If they did, they would have realized that closure would have completed the character’s journey. Perhaps they were hoping for a sequel? The quality of “It Stains the Sands Red” is captured perfectly with a scene involving Molly attempting to fight a zombie with a rock. Enough said.